A modular liquid circulating thermal system capable of temperatures in the range of -96C to +200C that can be fully integrated to supply stable, precise and reliable service. 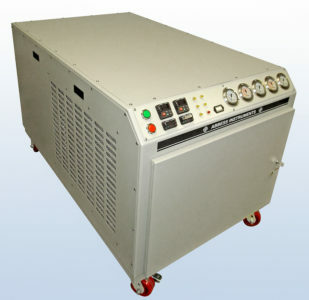 This -96C to 200C system provides modular and reliable thermal cycling. The Snow River™ Cascade Thermal System is the most flexible closed loop cooling and heating system offered by Abbess. This system utilizes both high and low stage compressors that work together to achieve the desired temperature with higher efficiency and deeper reach than a single stage or liquid nitrogen (LN2) system. Additionally, these systems eliminate the high running cost of liquid nitrogen systems and offer precise control across a wide range of temperatures from -96C to +200C. Due to the Snow River™ Cascade Thermal Systems modularity and Abbess Instruments staff of skilled engineers, these systems can be configured to handle any thermal load. Abbess has been providing reliable and efficient systems for more than 30+ years to industry leaders. PID temperature controllers offer precise thermal control and profiling. These controllers provide stand alone setpoint control and profiling capability or can be networked using RS-485 to be monitored and manipulated from an Abbess or customer designed PC interface. Modular cooling units provide scalable cooling capacity that minimizes the need for field service with simple on-site unit replacement and installs. Systems are replaced and installed in just a matter of minutes with no loss of fluid! Eliminates high running cost associated with liquid nitrogen used in open loop cryo cooling and freon used in large-scale refrigeration systems. These systems provide a significantly improved return on investment compared to other ultra-low temperature cooling systems. Controllable bath temperature provides for a better temperature gradient across load at steady state temperatures. Reduced cold spots that are experienced with liquid nitrogen cooling. Touchscreen PC control for complete control and monitoring of a single or of multiple Snow River™ thermal systems. Allow for the PC controller to make appropriate system changes to correct deviation from operational parameters. Systems with multiple Snow River™ systems have a recruitment function that can recruit and/or deactivate system modules as needed. The C80-4 model is our most popular model used for thermal control of thermal plates and shrouds within 24” vacuum test and process chambers. This model is capable of pre-cooling 20 gallons of silicone oil to -96C in approximately 4 hours and allows the system to cool a 36-pound (16.3 Kg) aluminum plate from +100C to -90C in about 1 hour. Our larger C80-6 system has been used in the past to cool a copper thermal shroud weighing nearly 1000 Lbs to -80C in just a few hours. By pre-cooling a sealed bath of silicone oil (-96C) and then pumping the cooled fluid through the heat load faster ramp rates are achieved. A pre-cooled fluid also allows for efficient cooling, better gradients across the load, more versatile plumbing configurations and simple system installation. Abbess’s thermal systems are available in a variety of sizes and configurations to fit your application. Thermal and vacuum systems can also be custom configured in sizes ranging from 440W (1500 BTUs/hr) to (13150 Watts) 45000BTUs/hr systems and can be designed to operate at low (-50C) and ultra-low (-96C) temperatures. These systems can be used in conjunction with our vacuum systems to provide space simulation profiles or they can be custom-made to provide cooling for a variety of other applications such as biological/medical storage and freeze drying. These systems are entirely customizable and can be sized to cool your product, environment or working fluid to specific temperatures at various rates. Abbess Snow River™ Thermal systems can be configured with air or fluid heat rejection. Redundant heat rejection options are also available. Our systems have been proven to be reliable and low maintenance in simulation systems produced for NASA and other prominent aerospace industry leaders for years and have earned a reputation for quality, performance and, control that is simply unmatched by any of our competitors. Integration of your process or thermal load with Snow River™ is easy! If you require temperatures in the range of -50C to 200C check out our Single Stage Snow River™ Thermal System! Abbess offers a variety of control diagnostic and test data packages that can fit your specific application and budget. These control systems could be as basic as a simple thermostatic control or as advanced as a data logging touch screen PC interface capable of integrated system diagnostics and test data, and networking of multiple chillers to handle large or variable loads. Stand-alone PID Temperature controllers can also be utilized for simple, precise thermal control and profiling. Touch screen PC control provides total and complete control and monitoring capabilities of your cascade chiller system. The PC interface allows for data logging of system temperatures and pressures as well as full remote control of PID temperature loops. The interface is capable of providing self-diagnostic information to the user and can be used with a single Snow River™ chiller or multiple chillers piped in series or parallel to manage large or variable loads.